Located on the Ashdown Forest with a diverse and friendly membership. Colemans Hatch Bowling Club is a small club with an excellent green with five rinks on a private green in a peaceful rural setting, with very little traffic noise, the occasional passing horse and the sound of ball on bat from the adjacent cricket ground. Sandy Lane is not the easiest place to find as it is not marked at the junction with Colemans Hatch Road but clear details of how to find us are set out on the Location page. Our members enjoy bowling at a variety of levels from roll-ups to matches. Visitors are very welcome. Guidance and plenty of friendly advice is always available from our experienced members. 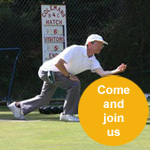 If you are interested in lawn bowling or are new to bowls contact us. Bowls is an active fun sport for all ages. There is no joining fee and our annual membership fee is very modest. All abilities will be made welcome. Our Club is open for prospective new members to try out our sport on Mondays at 2.30pm.